why living cells and new classes of organisms don't form by chance. 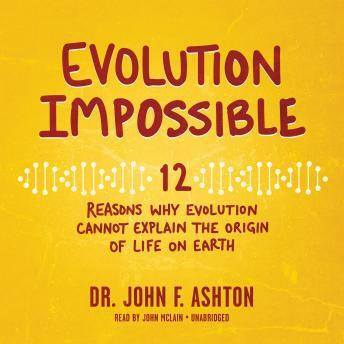 Using recent discoveries in genetics, biochemistry, geology, radiometric dating, and other scientific disciplines, Dr. Ashton explains chapter by chapter in straightforward language twelve compelling reasons why Darwin's theory of evolution is just a myth. Taking the evidence refuting evolution to a new level with a wide-ranging analysis, this is a must-listen book for all students, Christian educators, scientists, and anyone eager to defend a biblical worldview.